Not to be outdone by the Microsoft Skype, which released a touch-friendly Windows 8 Metro/Modern UI Skype app, Microsoft's Lync team announced a Lync app for Windows 8 and Windows RT also using Metro/Modern UI. This touch-friendly Lync app will be available in the Windows Store for both Windows 8 and Windows RT in late October according to the Lync Team Blog. This will be part of Microsoft Lync 2013, the latest iteration of Microsoft's unified communications platform that brings instant messaging, VoIP, collaboration and video conferencing to the enterprise. In addition to the touch-optimized Lync app, new versions of Lync server and desktop client is coming soon, as well as newer versions of their mobile clients and a browser-based Lync Web app, which will now feature multiparty HD video, voice over IP (VoIP), instant messaging, and desktop, application, and PowerPoint sharing. 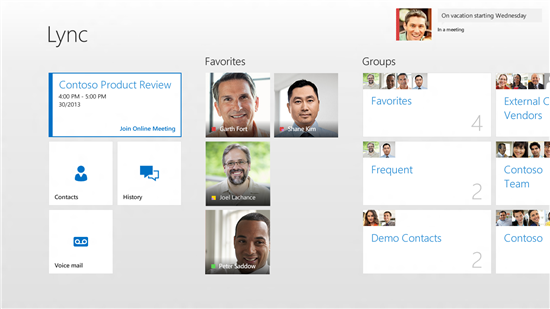 The new Lync App – which will be available in the Windows Store in late October and will be compatible with both Lync Server 2010 and Lync Server 2013 – is Lync re-imagined for the new Windows Experience, and optimized for touch, providing fast, natural, hands-on control of your communications. The new Lync App is a unified client integrating voice & video calls, Lync Meetings, presence and instant messaging in a fast, fluid, easy-to-use client. I’ve been using the new Lync App for the last few months, and it’s amazing – multiparty simultaneous HD video, one-touch Lync Meeting join, and an awesome snapped/filled view multitasking experience, just to name a few. Lync 2013 will also feature federation with Skype with full Lync presence, instant messaging, and peer-to-peer voice capabilities to Skype users.